The bell rang and the students thronged the corridors, rushing towards the huge carved main gate of the school. The scene took me into a flashback of my school memories. How excited we would be in the last class waiting for that final ring which would allow us to leave for home. While I was lost down memory lane, standing there at the entrance of Victoria School, a guard shook me asking my purpose of visit. I wanted to photograph the place for which he said that I needed permission from the school headmistress. That was again an arduous task. Yes, the fear of talking to a teacher for any permission is still bloodcurdling subconsciously. Anyhow, I walked up to the headmistress, who after an extensive interrogation was considerate enough to allow me photograph the building. The guard was to accompany me wherever I went, though. This was the Haveli of Prince Nau Nihal Singh, now known as Victoria School, located at a junction of Mori and Bhati Gate inside Old Lahore. This lofty Haveli is perhaps the most ostentatious of the surviving Havelis in Lahore. Amazing rectangular floor plan with two storeys the Haveli comprises a spellbinding central courtyard. Two additional stories in the northwest side of the Haveli provide an encompassing view of the Walled City from the roof top. The main entrance of the Haveli is from the street bound by an open space named as “Bhaiyon ka Maidan”. The haveli has numerous spacious chambers, halls and balconies. 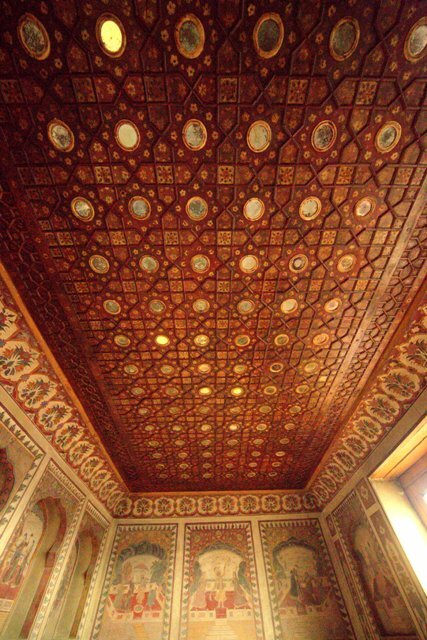 The roofs are decorated with paintings and mirrors while traces of gold are still seen. The walls are richly ornamented with glass work and flower paintings and fresco. The main façade of the haveli is no less startling. 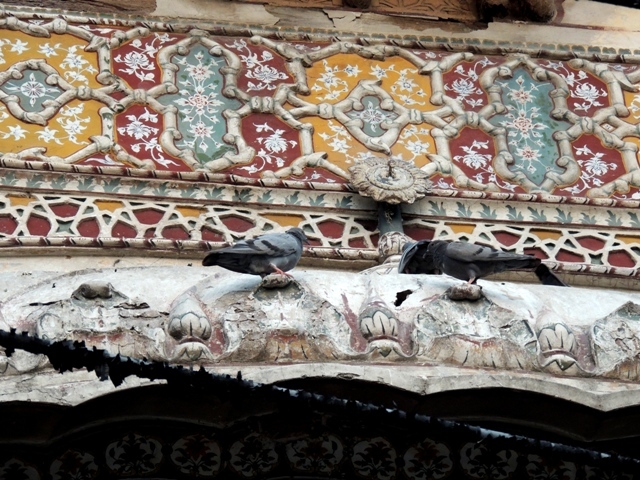 It is one of its kinds with brick work, fresco, jharokas and balconies. 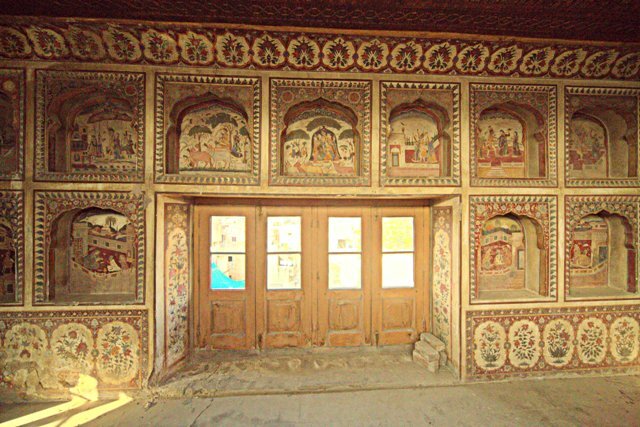 The façade is decorated with colourful floral designs in fresco along with carved jharokas which have animal and human figures on the pedestal of each. The pedestal of two side jharokas are brilliantly decorated with flower petal deigns. 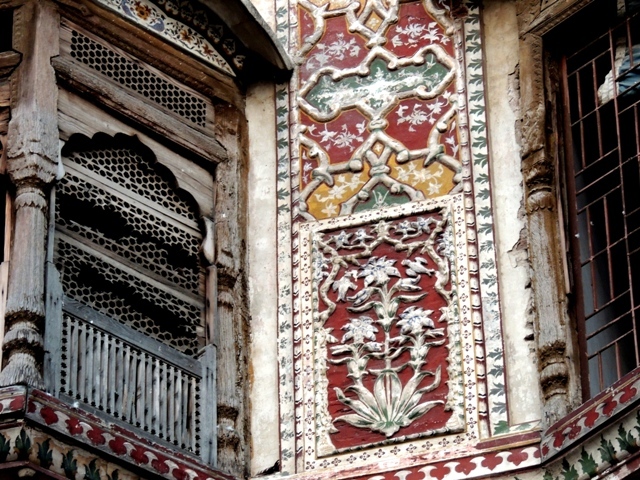 One can find a huge variety of floral patterns in this haveli, maybe the owner was an admirer of flowers. 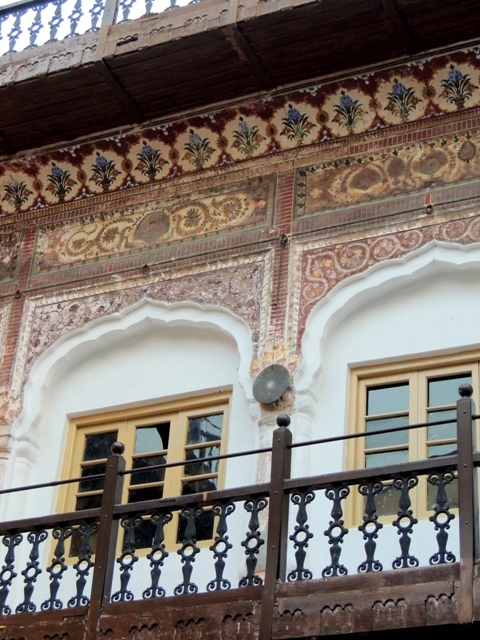 The back side façade of the haveli is richly decorated with stucco carving. The feature of brick work, carved animals and human faces on the font façade endorses the structure being related to the Sikh era. 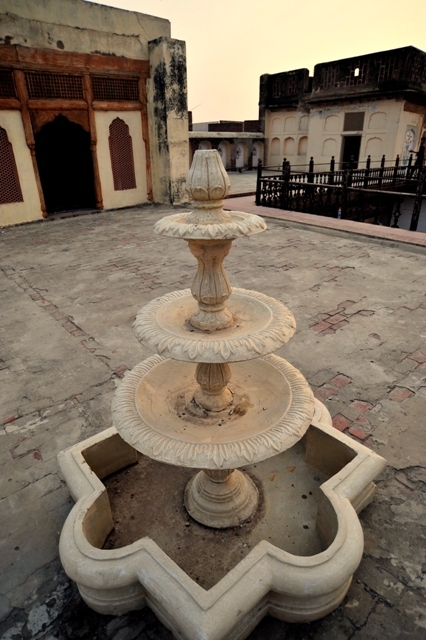 Fountains on the upper storey of the haveli are also seen and it must be a delightful sight in the past for the residents. 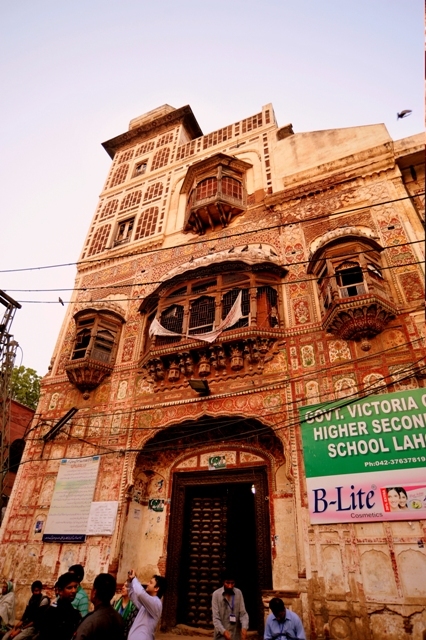 The haveli was taken over by the British Government when Punjab was annexed in 1849 and converted into the first public school for girls, The Victoria School. 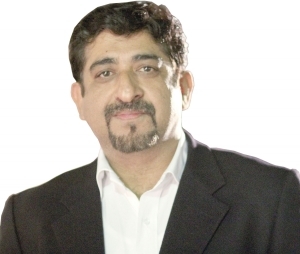 The school has been used in many Pakistani films and dramas because of its exquisiteness and splendour. The guard accompanying me everywhere said that the haveli belonged to Kanwar or Prince Nau Nihal Singh who was the son of Maharaja Kharak Singh. 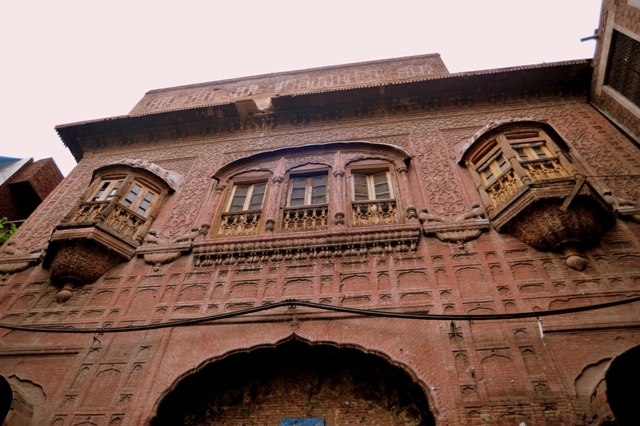 The Haveli of Kharak Singh is still seen inside Lahore Fort, which is being used as an archive room by the archaeology department of Punjab. After the death of Maharaja Ranjit Singh, Kharak Singh became king but was unable to keep control of a huge kingdom due to which Prince Nau Nihal took control of the state himself. Upon Kharak Singh’s death, Nau Nihal Singh was in line to become emperor. However, on returning from his father’s cremation while he was passing through Roshnai Darwaza leading to Hazuri Bagh, some bricks and stones fell on his head, which resulted in the death of his companions and injuring the prince, who was taken into the fort by the Wazir Dhyan Singh. During that time nobody else was allowed into the fort, not even his mother. Everybody was told that the Kanwar was recovering. The eyewitnesses said that the internal head injuries made him unconscious. The death was kept a secret for state security reasons for almost three days and later his mother and friends were allowed into the fort. Historians and eyewitnesses are still unsure if the death was accidental or deliberate and who was responsible, but the prince died at the age of 19. This marvellous haveli was the private home of the Prince Nau Nihal Singh. The structure is well intact maybe because it remained in use. It is far better in condition than the rest of the havelis in Old Lahore; especially since many have been put to commercial use. I hope this jewel remains saved.